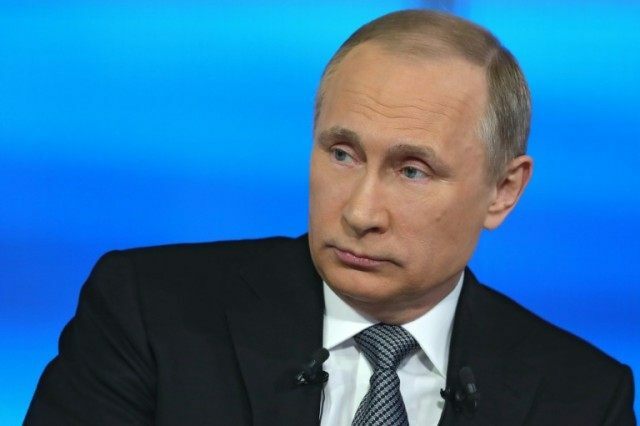 Moscow (AFP) – President Vladimir Putin insisted Thursday that while Russia’s crisis-hit economy remained crippled by problems there are reasons for optimism as he held his annual phone-in with the nation. “The situation has not recovered but the trend is positive,” Putin said after opening questions about the economic situation in the country, adding that Russia remained in a “grey” zone. Putin conceded that the government was forecasting a “small drop” in GDP this year of 0.3 percent following a slump of 3.7 percent in 2015, before growing by 1.4 percent in 2017. “What encourages this optimism? There are positive elements,” Putin said, citing growth in the agricultural and construction sectors. The International Monetary Fund said in predictions released Tuesday that the economy looked set to shrink by 1.8 percent and increase by only 0.8 percent in 2017. Russia is locked in a profound recession for the second year running on the back of the slump in the oil prices and Western sanctions slapped on Moscow over its meddling in Ukraine. The crisis has hit the purchasing power of average Russians and seen the number of people in the country living under the poverty line soar. Putin repeated that Russia needed to “change the structure” of its energy-dependant economy. “It is very difficult but despite everything we are advancing in this direction,” Putin said. Early questions this year during the phone-in focused on concerns over rising prices and falling living standards, as well as traditional bugbears such as the condition of the roads. Russia is gearing up for parliamentary elections in September and the government is seeking to keep a lid on any potential discontent over the deteriorating economic situation in the country.